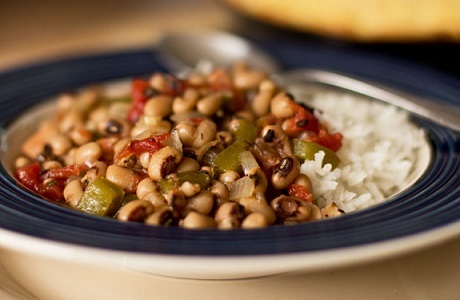 Hoppin John is a recipe using black eyed peas and rice and is traditionally prepared in parts of the south (USA) on New Year’s Day. It is said that as a meal or side dish it brings luck and wealth. The traditional dish is also usually served with collard greens and cornbread. Black-eyed peas are also sometimes called cow peas, or black-eyed beans and are used to make soups, salads, casseroles and fritters. Honestly, this is not a food item the restaurant prepares very often, even though I enjoy it, as do the guests after they have tried it. The restaurant is located in Washington State, where most guests have no idea about "Hopping John." But several times a year, the restaurant serves regional specialties and promotes those evenings in that way - for fun. The guests seem to like the idea. So this southern tradition is occasionally offered around New Year’s Day. Preparing black eyed peas usually involves cooking the dried peas for hours in a large pot, often with bacon or fatback, onions, and seasonings. When these peas are mixed with cooked rice - you've got "Hoppin John." Note: Fatback is fat from the back of a pig, not to be confused with salt pork, which comes from the belly or sides of a pig. Salt pork is also cured, while fatback is raw and uncured. Fatback is often used in traditional southern cooking. This "good luck" tradition apparently dates back to the American Civil War. Northern troops would often strip the countryside of all stored food, crops, and livestock and destroy whatever they couldn't carry away. At that time, these northern soldiers considered cow peas as "field peas," only suitable for animal feed and as a result, didn't steal or destroy black-eyed peas. This meant that the Southerners had something left to eat - lucky for them. Just as there are many variations of this recipe, there is also little agreement as to why the recipe is called "Hoppin John ." Some claim that there was a southern tradition of saying "Hop in, John" when inviting guests to dinner. Others say that there was an old southern tradition on New Year’s Day of having children hop around the dinner table before eating the dish. 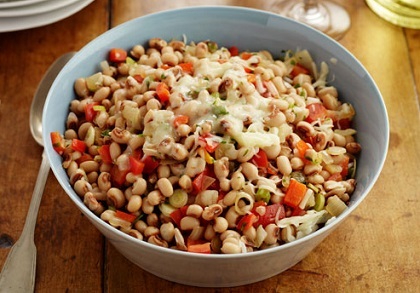 Still others believe the dish took its name from a crippled black man who was known as "Hoppin John" and was selling the meal on the streets of Charleston, South Carolina, well before the American Civil War. Another, and perhaps the most understandable explanation is that the name is an adaptation of the Creole French "pois pigeons," pronounced "pwah pee JON" (now "Hoppin' John"). But nobody really knows which of these theories is accurate, or if any one of them is. The recipe I have is a quick, easy version of the original. I really can't afford the time to cook dried black-eyed peas for hours, so I compromise and use canned peas. I also use a quality pork sausage instead of fatback. And I also sometimes use hot sausage to spice it up. You can also use bacon or ham in place of the fatback and it is equally as good. If you'd like to "go Southern" all the way, serve this dish with some collard greens. Simply saute some onion and bacon together, then add the greens and some water and cook for several hours. And don't forget the cornbread. 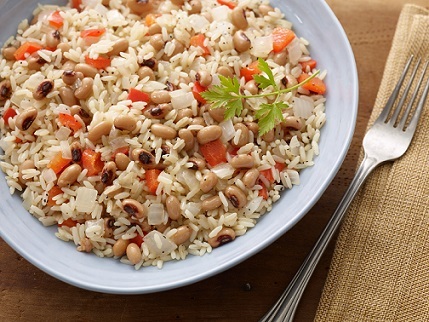 Enjoy your "Hoppin John" and the company of those you share it with! Luck and fortune to you all – and a tasty meal.